If you’re like me, a young professional making a decent income and living in Scandinavia, chances are you’re not as clever as you think; that is, with your finances. You’re probably hitting the nearest convenience store on your way to work and picking up a yummy latte, or heading out for lunch on occasion. In any case, you probably also consider the money left over from your salary as “savings.” The reality is that “savings” should be invested wisely and grow, grow, grow. Eating out and consuming lattes do not pay off. For instance, you would save roughly 7000 SEK per year (about 760 EUR) “if” you didn’t stop for that latte everyday. At ten percent annually, that 7000 can grow to 10,000 SEK in only five years. How many “obvious” saving methods can you accomplish? Let’s not kid ourselves, saving is hard work. Unless you’re an accountant, and love being one (who in their right mind would do this anyway? :-), you most likely hate spreadsheets. Imagine constantly hunting for a better price, or entering all your receipts onto a spreadsheet every month. Or, evaluating your budget goals every time you make a purchase. It can be time-consuming and frustrating. Investing, on the other hand, is another story: where do you start? How do you follow “market” changes? What is a mutual fund anyway? Well, luckily you’re not alone. The bottom line is: YOU DON’T NEED A FINANCE DEGREE to get your personal economy sorted. In fact, thanks to some of these “finance people,” a few handy apps are now available to help us out. Here are Five Top Useful money-saving apps that will help pave your way to changing money spending habits and aid you in sensible investing. There are actually quite a bit of lists online already, for example Mashable’s 25 Apps to Save You Money. So, why is my list of apps better than Mashable’s list? Well, do you live in Scandinavia (Sweden, Norway, Finland, Denmark)? If so, just start downloading the apps listed below because Mashable’s list is pretty much useless! If you live in the US, just be impressed by what the Swedish tech community is capable of and take notes. Tink is my favourite financing app. Connecting any bank account in Sweden is easy as pie. You only need to apply for mobile banking at your bank, then you’re in business . It’s also quite secure: Tink retrieves your transactions every time you log in and does NOT store them. It actually automatically categorises them into groups like Food, Hobby, Restaurants, and Working out. Then, it presents your expenses vs incomes in a really nice and understandable format. You can also set budget goals. For example, maybe I want to spend only 200 kr on lattes this month. When you are close to exceeding your budgeted goal, the app will send you a “push” notification to remind you to focus! I find Tink immensely useful. It has helped me break down my expenses into comprehensive categories. Using it has motivated me to think about what habits I should change to achieve my financial goals. 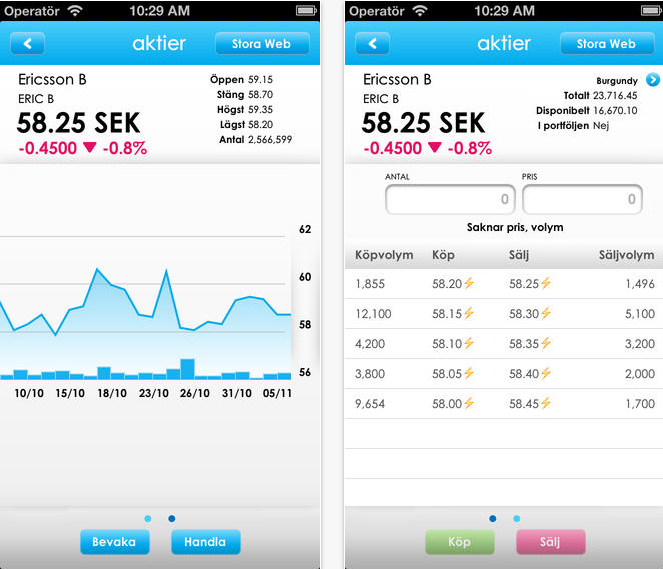 Nordnet aims to become the first choice in “savings and investments” apps for everyone in Scandinavia, and I must say they work hard at it. Firstly, Nordnet provides an online platform where anyone can easily buy stocks and funds, as well as follow all the analytics around it. They have much lower fees than what traditional banks offer, they include a wider range of markets and mutual funds, and most importantly, it has very user-friendly interface – web and mobile platforms. Start with opening an investment savings account (investerignssparkonto) and develop a strategy of how much money per month you can stock away. You can even connect a Nordnet account to your main bank account and set up an automatic monthly transfer to your choice of funds or stocks. Deciding what to buy might be confusing, so Nordnet put together a survey. You can answer a few questions to determine what risk level you are prepared for and Nordnet will make recommendations based on your expectations. Get an app for your mobile phone to keep an eye on your portfolio and study how certain stocks behave. Unfortunately, Nordnet’s Android app is not up to the task, but if you have an iPhone or an iPad, you’ll be happy. Be careful and don’t put all your eggs in one basket. Spread your investments in small batches, don’t buy stocks in companies you know nothing about, and don’t risk what you are not prepared to lose. We’ll share more tips on investing in funds and stocks later, but for now, opening a Nordnet account and setting up a monthly savings transfer with a moderate level of risk is a great start if you are just starting out. 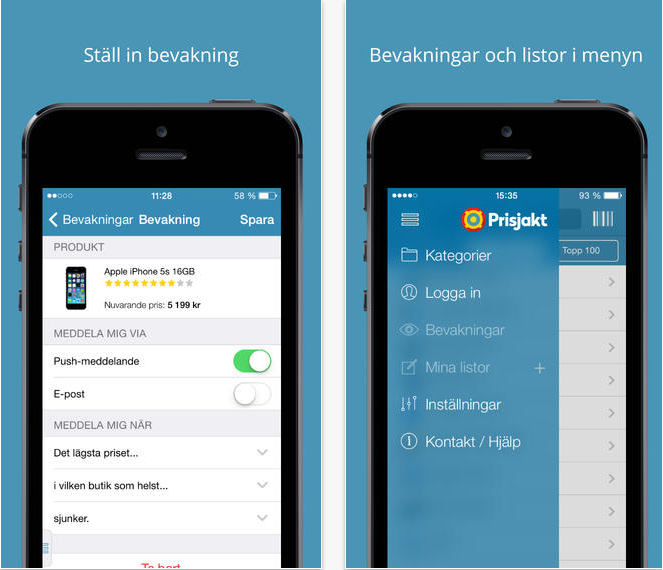 Prisjakt is the app to get if you want to take control of your spending habits. Step one is to not make impulsive purchases! If you decided to buy something expensive, for example a new phone or a computer, think twice and delay your purchase. Compare prices thoroughly. Prisjakt will find the best prices for you and what’s better, the app will notify you when the thing you want went down in price. The tedious task of comparing offers and prices in stores near you just became dead simple. Grab your phone, type in what you’re looking for and get a good deal! I personally find the mobile version of the site much nicer looking and easier to use than the website. Living in Sweden or any Scandinavian country for that matter, the biggest monthly expense after rent would probably be food. Even if you don’t eat out much, just buying groceries can rip a hole in your budget. So, how can that be avoided? First, plan out the week before going food shopping. What will you cook? What ingredients will you need? Matpriskollen will conveniently connect your shopping list to the best offers at your local grocery stores. Coupons 2.0 it’s a nice way to structure your food shopping…and save money! This app is exclusively for the Swedish market. First of all, if you can, stay away from loans. For someone who has no real control of their private finances, loans can become a true disaster. Sometimes, however, there is no other way. For many people living in Stockholm, buying an apartment is the only way to get a place to live. However, it’s a great investment! If you are about to sell your apartment, it would be wise to renovate it – making “borrowing” unavoidable for most people in this situation. To make the right choice, a thorough research of the terms and conditions of different banks and organisations is needed. Here is where Advisa comes in to play. I haven’t used the service myself, but heard only good things about it. You can sign up for Advisa’s web app via their online form or by calling. For example, if you follow this link and fill in your loan requirements, banks start bidding on your request and you end up getting the best offer. Hopefully, the service expands in the future and goes more public, making its way to the very phones we carry with us everyday. That’s it! All apps/services mentioned are free and technologically advanced. If you have more tips on apps that help save money, please share them in comments! Tink is my favourite app! I use it all the time – never knew my food cost THAT much! Me too! Exactly, when I so my food bill per month… Oh, God, I could make a little weekend trip to some country once a month on this amount!… Crazy! Thanks for the wonderful practical tips! Just one newbie question: compared to investing platforms offered by major banks as part of having one’s account there, what are the advantages of using, for instance, Nordnet? Hi, thank you for a valuable comment. I am actually on the way to write a separate post about Nordnet and Avanza online trading platforms. But the main difference is in the charging fees. Nordnet and Avanza charge around 1 sek per deal, when trading fee in major banks are around 100 sek per deal.